After five years of focusing on the Connect pillar of our strategy and tremendous success of the Auction Program, Women Who Rock is moving to Communicate and Collaborate pillars as we believe that only collectively with all our stakeholders we can tell our positive stories and attract the next generation of leaders. 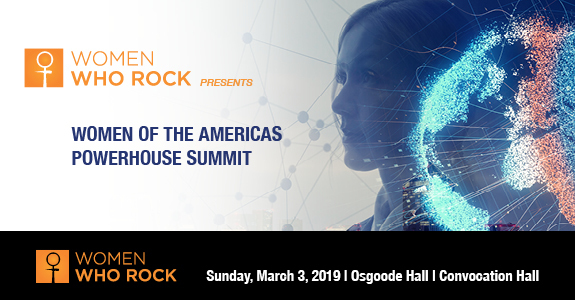 The Women of the Americas Powerhouse Summit is an inaugural international diversity event to be held during the PDAC 2019 Convention on Sunday, March 3, 2019 at the historic Osgoode Hall. In collaboration with Natural Resources Canada and TMX Group, this exclusive event, by invitation only, features four remarkable women leaders, representing Argentina, Canada, Mexico and Peru. These trailblazers, all linked by their passion for mining, will tell their compelling success stories while championing the mining industry as the industry of choice for the next generation of leaders in the Americas.